ETH/USD market opened at $136.75 this Saturday. ETH/USD has little scope for growth as bulls face a large stack of resistance up front. The ETH/USD market opened at $136.75 this Saturday. Previously on Friday, ETH/USD bulls outlasted the bears as they managed to bring the price up from $135.60 to $136.60. 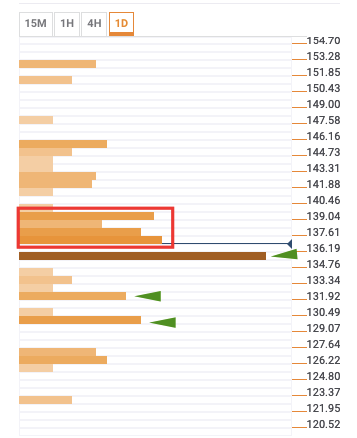 According to the daily confluence detector, Ethereum is sandwiched between a large stack of resistance up front and a strong support levels down below. $135: 4-hour Bollinger band lower curve, weekly 61.8% Fibonacci retracement level, daily 23.6% daily Fibonacci retracement level, and hourly Bollinger band lower curve. $132: Weekly 23.6% Fibonacci retracement level and weekly pivot point support 1. $131: Previous week low, daily Bollinger band lower curve, and daily pivot point support 2. The ETH/USD daily confluence detector has a stack of resistance from $137-$139.50. The confluences at these levels are – Daily Bollinger band middle curve, daily 38.2% Fibonacci retracement level, 15-min Bollinger band lower curve, 100-day simple moving average (SMA 100), SMA 5, hourly previous low, 15-min previous low, hourly Bollinger band middle curve, 15-min previous high, SMA 10, hourly previous high, 15-min Bollinger band middle curve, SMA 50, SMA 200, daily 61.8% Fibonacci retracement level, 4-hour previous high, 4-hour Bollinger band middle curve, hourly Bollinger band upper curve, and previous week high.